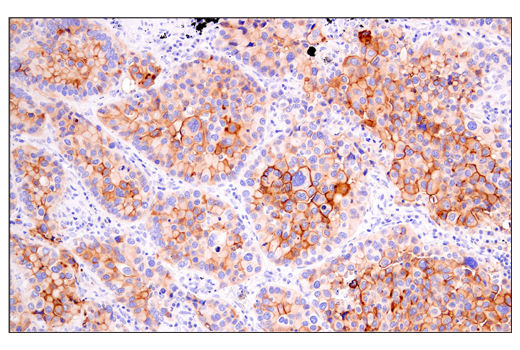 DAF/CD55 (E7G2U) XP® Rabbit mAb recognizes endogenous levels of total DAF/CD55 protein. Monoclonal antibody is produced by immunizing animals with a synthetic peptide corresponding to residues surrounding Lys110 of human DAF/CD55 protein. Western blot analysis of extracts from various cell lines using DAF/CD55 (E7G2U) XP® Rabbit mAb (upper) and β-Actin (D6A8) Rabbit mAb #8457 (lower). 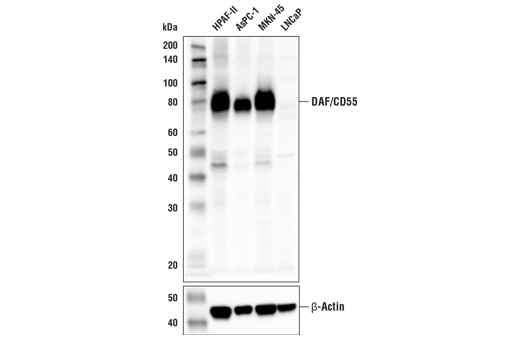 As expected, DAF/CD55 protein expression is not detected in LNCaP cells. Western blot analysis of extracts from HeLa cells, mock transfected (-) or transfected with siRNA targeting human DAF/CD55 (+), using DAF/CD55 (E7G2U) XP® Rabbit mAb (upper) and β-Actin (D6A8) Rabbit mAb #8457 (lower). 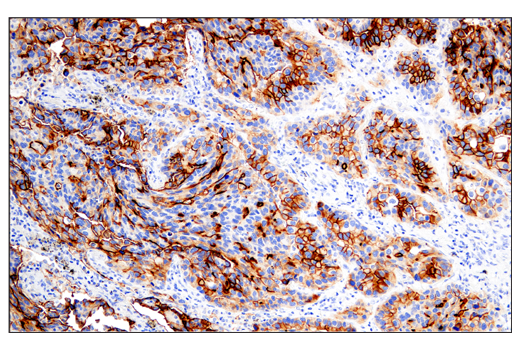 Immunohistochemical analysis of paraffin-embedded human lung adenocarcinoma using DAF/CD55 (E7G2U) XP® Rabbit mAb performed on the Leica® BOND™ Rx. 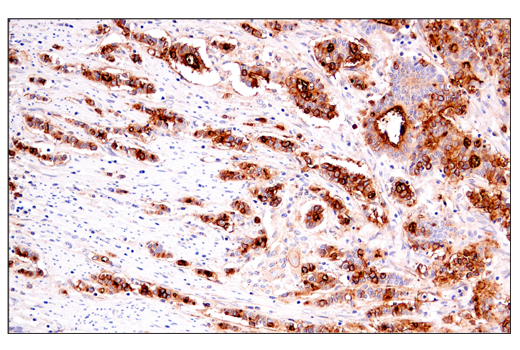 Immunohistochemical analysis of paraffin-embedded human colon carcinoma using DAF/CD55 (E7G2U) XP® Rabbit mAb. 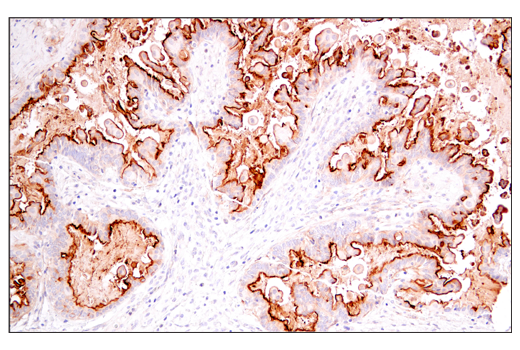 Immunohistochemical analysis of paraffin-embedded human esophageal carcinoma using DAF/CD55 (E7G2U) XP® Rabbit mAb. 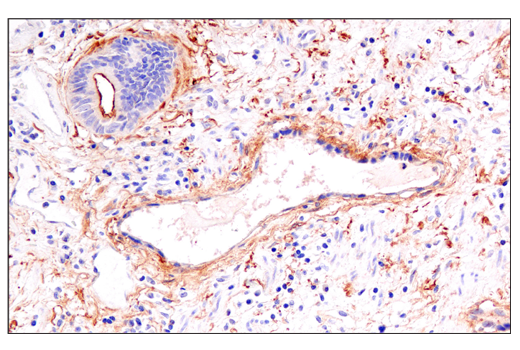 Immunohistochemical analysis of paraffin-embedded human lung adenocarcinoma using DAF/CD55 (E7G2U) XP® Rabbit mAb. 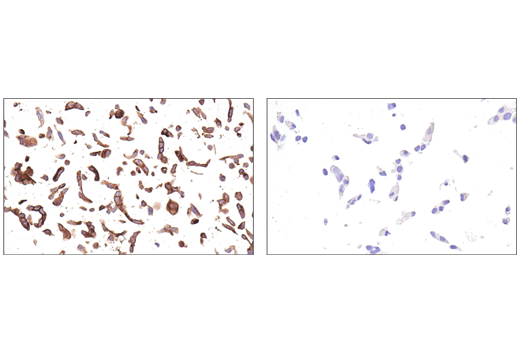 Immunohistochemical analysis of paraffin-embedded human ovarian serous carcinoma using DAF/CD55 (E7G2U) XP® Rabbit mAb. Immunohistochemical analysis of paraffin-embedded HPAF-II cell pellet (left, positive) or LNCaP cell pellet (right, negative) using DAF/CD55 (E7G2U) XP® Rabbit mAb. Decay-accelerating factor (DAF/CD55) is a GPI-linked plasma membrane glycoprotein normally expressed on the surface of vascular endothelial and hematopoietic cells, which are continuously exposed to autologous complement components. 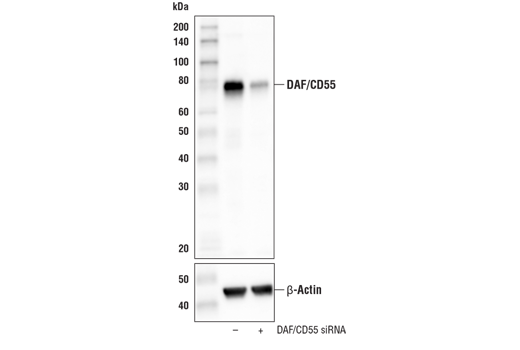 In conjunction with other membrane complement regulatory proteins (CD35, CD46, and CD59), DAF/CD55 protects healthy cells from inappropriate complement-mediated lysis (1). DAF/CD55 inhibits activation of the complement cascade by promoting membrane dissociation and inactivation of C3 convertase, which inhibits amplification of the classical and alternative complement cascades (2). Research studies have demonstrated that DAF/CD55 is overexpressed in a variety of solid and liquid tumors, which functions to protect tumor cells from complement-mediated attack (3,4). Given its ability to disable the complement cascade and facilitate immune evasion by tumor cells, DAF/CD55 has received attention as a potential therapeutic target for the treatment of human malignancies. CD55 deficiency is also linked to human disease. The inability to express CD55 on the surface of erythrocytes renders them highly susceptible to complement-mediated lysis, which contributes to the development of paroxymal noctural hemoglobinuria (PNH). PNH is characterized by hemolytic anaemia, pancytopenia, and venous thrombosis (5). Fishelson, Z. et al. (2003) Mol Immunol 40, 109-23. Brodbeck, W.G. et al. (1996) J Immunol 156, 2528-33. Inoue, T. et al. (2002) Mol Pathol 55, 193-9. Niehans, G.A. et al. (1996) Am J Pathol 149, 129-42. Brodsky, R.A. (2014) Blood 124, 2804-11.